For many, Walt Disney World® Resort, Florida evokes memories of amusement park attractions, animated characters, and junk food galore. But did you know there are tons of other activities to explore at Walt Disney World® Resort, Florida? In addition to the classics – Space Mountain, Pirates of the Caribbean, Splash Mountain, etc. – here are five alternative activities you can experience while you’re at Compference18. “A Spectacular Celebration of Global Cuisines, Music & More!” The 2018 Epcot® International Food & Wine Festival, a special seasonal event, will be in full swing during Compference18. There will be tastings, beverage and cheese seminars, culinary demonstrations and more. Note, this event takes place at Epcot World Showcase, and will require a park admission. Get a kick-start to the Halloween season. For the young – and the young at heart – Mickey’s Not So Scary Halloween Party will get you in the holiday spirit (pun intended). Come dressed in your favorite (family friendly) costume, or just enjoy people watching. Attend the Scream-o-Ween Dance Party, or experience the Halloween-themed rides and attractions. Note, this event takes place select Mondays, Tuesday, and Fridays at Magic Kingdom Park Walt Disney World® Resort, and will require a park admission. Experience the timeless charm of Disney’s BoardWalk. There’s something for everyone to enjoy at this quarter-mile promenade featuring fine dining, unique shops and exciting nightlife. Stroll along the water’s edge, play afternoon midway games and enjoy evening street performers. Reminiscent of turn-of-the-century boardwalks like Coney Island and Atlantic City, Disney’s BoardWalk is a short stroll to Epcot and a breezy boat ride to Disney’s Hollywood Studios. Bring along a friend (or three) and rent a Surrey Bike for a fun excursion on wheels. You can explore waterfront boardwalks and woodsy pathways. Cruise along the banks of the Sassagoula River, pedal down the promenade by Barefoot Bay, or wheel around a woodland trail. Agoraphobic adventurers can opt for traditional single rider bikes instead. There are rental locations throughout the Walt Disney World® Resort, FL. Check the Surrey Bikes page for more details. After a busy day of working, learning and networking, you might enjoy a respite from all the buzz. Why not treat yourself to a rejuvenating spa experience? Feel your cares melt away with a relaxing massage, or awaken your senses with a luxurious facial. There are various spa locations throughout the Walt Disney World® Resort, FL. Appointments are strongly recommended. See the Spas page for more information. 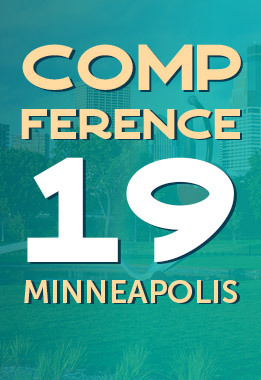 Still on the fence about coming to Compference 18? Check out some testimonials from previous year’s attendees, or get a sneak peak of the sessions you can choose from.